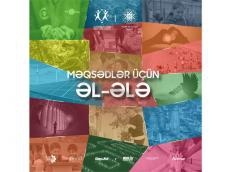 ASAN Volunteers and Azerbaijan Youth Foundation have launched new initiative. The project entitled "M?qs?dl?r üçün ?l-?l?" aims to promote the Sustainable Development Goals (SDGs) among young people (officially known as Transforming our world: the sustainable development agenda for the period up to 2030), Trend Life reported. On September 25, 2015, the UN member states adopted the 2030 sustainable development agenda. It contains a number of goals aimed at eradicating poverty, conserving the resources of the planet and ensuring well-being for all. Each of the 17 Goals contains a series of indicators that must be achieved within 15 years. The achievement of the Sustainable Development Goals requires the joint efforts of governments, the private sector, civil society and the inhabitants of the Earth. States recognize that measures to eradicate poverty must be taken in parallel with efforts to increase economic growth and address a range of issues in education, health, social protection and employment, as well as combating climate change and environmental protection. "M?qs?dl?r üçün ?l-?l?" will cover five regions of Azerbaijan. In conclusion, the project participants will form teams and present their presentations. The best will be awarded with valuable prizes.